On May 2, in the pine forests of Zakimi in Yomitan, Okinawa Meteorological Observatory confirmed hearing the first song of the Platypleura kuroiwae species of cicada. This is the earliest since they started monitoring it in 1958. 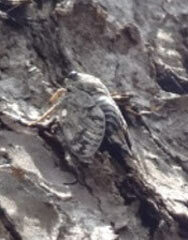 According to previous data, this cicada usually first announces its presence on June 3, but last year it was on May 7. This species inhabits the Ryukyu and Amami Islands. The meteorological observatory has been monitoring their first call to assess the timing of the change of seasons. Their song reaches its peak in June and July. In the northern part of the main island of Okinawa they can be observed until around November.